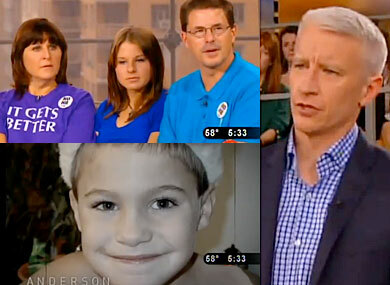 On Monday's special anti-bullying episode of Anderson Cooper, the talk show host spoke with Tracy and Timothy Rodemeyer, parents of Jamey Rodemeyer, a gay teen who took his own life only weeks ago after constant bullying became too much for him to bear. The heartbreaking episode was taped just nine days after Rodemeyer was found hanging from his swing set by his sister. While photos of a cute and cherubic Rodemeyer flashed on screen, his mother solemnly told Cooper, "It is the same swing set that he was on since he was three years old. That we built special for them." Jamey’s sister, Alyssa, performed a tribute song she wrote for her brother. She courageously admits to her own bullying behavior, apologizes for her wrongs and shares how Jamey's death has affected her. Cooper introduced the Rodemeyers to the Jacobsens, another family mourning the loss of their son to suicide over bullying, in hopes that these families can support each other as they grieve. Cooper also spoke with a bullying survivor, Emily Carey, and her mother, Carla. And Dr. Dorothy Espelage offered up tips for parents and the community on what they can do to help prevent bullying, and how to tell if something is going on with a child. Watch highlights from the special on the following pages.